This is Jessie Burton’s second novel, following her very successful debut, The Miniaturist. I had one or two problems with The Miniaturist and didn’t fall in love with it the way so many other people seemed to, but I did like it enough to be interested in reading more of her work. The Muse is split between two different time periods. In 1967, we meet Odelle Bastien, a twenty-six-year-old woman from Trinidad who is looking for work in London. As she settles into her new job as a typist at the Skelton Institute, a prestigious art gallery, Odelle strikes up an unusual friendship with her employer, the glamorous and secretive Marjorie Quick, who encourages her to follow her ambition of becoming a writer. At a party one night Odelle is introduced to Lawrie Scott, who shows her a painting he has inherited from his mother. A few days later he brings it to the Skelton where it causes a great deal of excitement; it seems that Lawrie’s painting could be a lost masterpiece. To discover the origins of the painting, we have to go back to Spain in 1936 where Austrian art dealer Harold Schloss and his English wife, Sarah, are living in a rented finca – a country house – in a village near Malaga. The couple’s daughter, nineteen-year-old Olive, has ambitions of her own but is keeping her talents hidden knowing that they wouldn’t be appreciated by her father. When local painter and political activist Isaac Robles and his sister Teresa come into her life, Olive has some big decisions to make; this could finally be her chance to follow her dreams. What is the truth behind the painting once owned by Lawrie Scott’s mother? What really happened to the artist Isaac Robles, whose final fate is unknown? And is Marjorie Quick really who she claims to be? 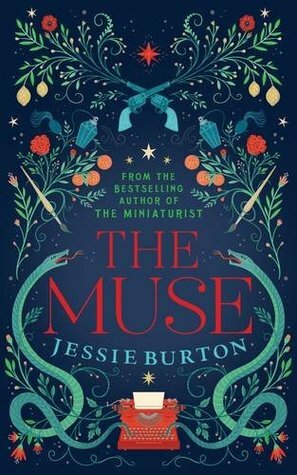 Like The Miniaturist, The Muse has an element of mystery, but unlike the previous book, it is grounded entirely in reality with no hints of the supernatural. I thought the writing style felt quite different too, especially as this one is written in the past tense instead of the present tense of The Miniaturist. In fact, I would almost go so far as to say that they could have been written by two different authors, which is not necessarily a bad thing as it’s good to see authors trying something new. I found both threads of the novel interesting to read. In the 1960s, Odelle gives us some insights into what it’s like to be an immigrant from the Caribbean living in Britain and what it’s like to be black in a predominantly white community. However, I couldn’t help thinking that Odelle herself feels almost superfluous to the story; it’s Lawrie who owns the painting and Marjorie Quick who is connected in some way with the events of 1930s Spain. Usually in this type of novel, the modern day (or relatively modern, in the case of this book) narrator has some kind of personal link with the historical characters, but Odelle doesn’t, which seemed a bit strange to me. The 1930s storyline is where most of the real action takes place. With Spain on the brink of civil war at that time, Spanish politics form a large part of the story – not just as a backdrop, but with a real significance to the lives of the Schloss and Robles families. A lot of care has obviously gone into creating the Spanish setting – the descriptions feel detailed and vivid – but again, my problem was with the characters. None of them came fully to life for me and I struggled to understand their motives and the decisions they made. Although there were some aspects of the novel I liked – such as the mystery surrounding Marjorie Quick and the exploration of the struggles faced by women in the worlds of art and literature in years gone by – I think of Jessie Burton’s two novels I probably preferred The Miniaturist. I was interested to read that you weren’t convinced by The Miniaturist, as I wasn’t either. I started The Muse with an open mind, hoping that it would be better, but I really didn’t like it. I thought that the central premise about an artist and their relationship to their work (sorry if this is a bit unclear but I didn’t want to have spoilers) was highly improbable, I didn’t find the Spanish sections convincing and it just didn’t hang together. In fact, I gave up half way through as I had books I really wanted to read clamouring for my attention. I’ll probably try Jessie Burton’s next book but I hope it doesn’t turn out to be as disappointing as this. Sorry to hear you were disappointed with The Muse too, Pam. I know what you’re referring to regarding the central premise because I found it very unlikely as well. The actions and motivations of some of the characters just didn’t make sense to me, especially in the Spanish sections. I’m not sure if I want to read any more Jessie Burton books, but I could be tempted. I like your comparisons between the two novels. I read a number of novels about painting and painters last year, so I have moved on to other things this year, but due to its ties to the Spanish Civil War I am going to put this one on my TRB. I thought the Spanish Civil War aspect was interesting. There were a lot of things I liked about this book, so it’s a shame it just didn’t work for me as a whole. Why write a dual narrative when the characters share nothing in common? I’ve read some great dual narrative novels, but this one isn’t very successful, in my opinion. Hmm, The Miniaturist was one of those novels that I kept looking at but never actually decided to read. Maybe I’ll wait to see if she ever gets a handle on her characters. I think The Miniaturist is definitely the best of her two books, but I didn’t love that one either. I have this book on the shelf. I enjoyed Miniaturist but was disappointed with the climax. I think Jessie Burton has a lot of potential as a writer. Maybe you’ll enjoy this one more than I did. I did like The Miniaturist but I remember feeling that the mystery element was never really resolved. That was my feeling too – so many loose ends and unanswered questions, almost as if the author had come up with this brilliant idea (and it was brilliant, which was why I think I was so disappointed) and then didn’t know what to do with it or how to resolve it. I have been looking forward to hearing your thoughts on this, so I am sad to hear you didn’t enjoy it as much as The Miniaturist. Me and my mum loved The Miniaturist because of its wonderful setting and the doll house and miniatures; my mum makes miniatures too! From reading your thoughts, I think this setting and characters would hold less appeal for us as well. Those are the things I liked about The Miniaturist too. This book is very different in terms of setting, plot and even the writing style, and I’m hoping that if Jessie Burton writes a third book it will be more like The Miniaturst than this one. You never know, though – you and your mum might enjoy this book a lot more than I did! I haven’t come across either book, and after reading your reviews I don’t think I’ll go looking for them. The Miniaturist is probably worth reading if you do come across it anywhere, but I wouldn’t bother with this one. Interesting review, Helen. For whatever reason I never felt drawn towards even considering The Miniaturist; despite the hype I barely wanted to know the premise of the book. It always intrigues me when this happens as there seems no clear reason for it. It meant that I hadn’t even read the blurb for The Muse until your review. Based on your thoughts, I’d be more likely to read The Muse than The Miniaturist. But I can’t see that happening any time soon! I can understand that, Sandra, as it happens to me too sometimes. I tend not to be very interested in books that are surrounded by a lot of hype, though in the case of The Miniaturist I had received a review copy and read it before the hype had really begun. The Muse is a very different type of book, so I can see why one might sound more appealing than the other.